John C. Calhoun moved from a plantation in South Carolina to a Yale dorm in November, 1802, where he studied under Timothy Dwight and Benjamin Silliman. His Yale tuition was paid from profits derived from slave labor. When he graduated, he won acclaim as one of the best students in the class of 1804. After graduation Calhoun returned South to marry his cousin Floride and live the life of a slaveholder and statesman. Prior to his wedding, Calhoun had purchased an 800-acre plantation near Willington, South Carolina. Located on a bluff along the Savannah River, the plantation had a modest house, fertile land and "substantial barns and well-built slave quarters" (55). Calhoun had grown up in a South Carolinian family that talked about slave labor in much the same way as they did about corn, wheat and hogs (56). The growth of the Calhoun family's estates coincided with the expansion of the world market for cotton. Calhoun thus gained both in wealth and might as the market for cotton expanded during the first half of the nineteenth century. Calhoun was not merely a farmer. He rose to hold a position preeminent among the politicians of his era. He was elected to Congress in 1811, a mere seven years after graduating from Yale. Appointed U.S. Secretary of War from 1817-1825, he was then elected U.S. Vice President, where he served two terms under two different presidents, until 1832. He then served as Senator from 1832-43, as U.S. Secretary of State from 1844-45, and went back into the Senate from 1845-1850. Calhoun occupied national political office in this country for almost 40 years, wielding enormous political influence on the preservation of slavery. From these offices, he explained why he thought slavery was great and why he thought the democratic idea of universal equality was wrong. In 1930, Yale University decided that one of its residential colleges should be named "Calhoun College," in honor of this man. When Yale University built Harkness Tower in the 1930s, Calhoun's statue was installed as one of the eight Yale graduate "Worthies" of honor. These decisions were controversial from the start (64). In fact, in 1992, a group of undergraduates from Calhoun College protested the name of their college. 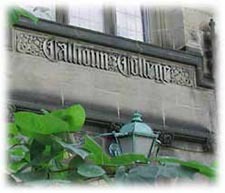 Yale refused to consider renaming the college, but did hang a framed poster inside Calhoun College, acknowledging the controversy. It is true that Yale's first two centuries boast no other U.S. Vice President or President (65). However, honoring John Calhoun today raises a question: Does the fact of political power by itself merit honor?